Jason Collins and Oliver Richards expect a resurgence on fertility in developed countries. We propose that the recent rise in the fertility rate in developed countries is the beginning of a broad-based increase in fertility towards above-replacement levels. Environmental shocks that reduced fertility over the past 200 years changed the composition of fertility-related traits in the population and temporarily raised fertility heritability. As those with higher fertility are selected for, the “high-fertility” genotypes are expected to come to dominate the population, causing the fertility rate to return to its pre-shock level. This is not really new news. Delayed child-bearing and other attributes are being selected against. Natural selection sped up reproduction among French Canadians. Africa is a continent whose demographic trends already do not fit the Panglossian projections of some commentators about how we've supposedly licked the overpopulation problem. In the next 90 years Africa's population will go up by more than a factor of 4. Quadrupling. Good bye many species of plants and wildlife. The new statistics, based on in-depth survey data from sub-Saharan Africa, tell the story of a world poised to change drastically over the next several decades. Take a look at Tanzania, which is today one of the poorest countries in the world. As of 2000, it had 34 million people; California’s population was the same that year. Today, Tanzania has about 45 million people. By 2100, its population is projected to be 276 million – almost the size of the entire United States today, and by then one of the largest countries in the world. The whole world is on course for a huge resurgence in fertility. Natural selection assures this outcome. The only way I can see to prevent it: government-mandated genetic engineering of offspring to reduce the next generation's desire to have kids. But I doubt that will happen. One of the reasons I am not optimistic about the future is natural selection. Selective pressures are more powerful than our conscious minds. The part of our minds that thinks it controls the speech center is deceived into thinking it is in charge. Our conscious minds do far more rationalizing and far less rational reasoning than we think we do. I give us poor odds of getting in control of our instincts and curbing their most damaging manifestations." This does seem a problem to which there is no humane solution. And one where exponential growth controls so that it only gets worse with time. On the other hand so long as baseline economic growth is greater than population growth (which rarely tops 1%) it is not a Malthusian problem. Nobody is going to starve, at least not without the actions of warlords. Even in the very long term I think population can expand enormously. I have written previously of how we could build many millions of O'Neill colonies which would mean we could support a population thousands of times Earth's current one. 700 years at 1% annual growth would not be enough to achieve that. Where there is a problem is with differential demographic growth. Differential growth means some communities will be swamped, as the Serbs, who had lived in Kosovo for at least 1,000 years (as place names and 1,000 year old churches prove) were swamped by Albanian (not all local demographic growth but even where it was immigration part of the driver for that was high population growth in Albania). The other driver of immigration was people in poor countries wanting to move to rich ones, in the same way that water runs downhill. This, plus the fact that poor peoples tend to have more kids, means that population growth brings down competence. It means that failing cultures outbreed successful ones. It means, if IQ testing around the world is of any use in finding IQ, that the future belongs to low IQ sub-Saharan Africans, rather than Parsees, Jews, Japanese or Chinese who all score above average on IQ. Cultures which deny population controls (Amish, Catholics) or deny women the right to choose (Islam) will gain through differential growth, assuming they are able to prevent people quitting. I would not like such cultures to supplant what we call western civilisation but the universe will not, without us doing something, arrange things as we wish. So on a 1% annual growth rate we will be ok for 2,100 years or if we conquer the universe, 28,000 years. So nothing we should consider now. In this talk I will outline an argument that a good energy policy is not only critical to get us out of recession but that energy is so intrinsically linked to GDP that energy policy more or less dictates how our economy performs. My five year old son said: “ENERGY IS THE POWER TO MAKE US DO THINGS"
Coriolis introduced the idea of energy being the work done. Work is things such as lifting a weight up or e.g. the work done by a weight dropping. For example the weight in an old clock does so much work or a certain weight of water turning a water mill. With the development of steam power, people began to realise that burning things to produce heat was also a way of creating energy or replacing the work done by a human or animal turning a wheel. At first people like the Luddites thought that all this "cheap labour" produced by burning wood or fossil fuels like coal was a "bad thing" because in effect coal was a cheap labourer replacing the more costly "food powered labourer". Replacing human labourers, by machinery did not end the need for human labour. In the industrial age, mankind's labour was needed in addition to machinery. We had "human machines" whose energy derived from food. And machines producing work, first from water & wind, and then the cheaper coal and eventually gas and oil. Both machines and humans "work". Rising GDP is an indication of a prosperous economy. In other words when GDP is rising even allowing for inflation, we are all earning more and more or to turn it around, we are all spending more and more. The key to understanding GDP, is to understand how inflation is calculated. This is done by calculating the cost of a "basket of goods" which is thought to represent the cost of goods purchased by the typical household. So, if the cost of this basket increases, inflation goes up (seldom comes down). So, another way to describe rising GDP is that on average we can all purchase a bigger and bigger basket of typical goods. Both energy and GDP are related to work. GDP is the goods the average person can purchase on an average income. Energy is the work done by a unit of energy ... which at one time was the average work by a person. GDP is earnings from the work done by the average person. A long time ago, the work done in the economy was entirely human. That work was powered by food. Then about a million years ago, man stumbled across fire - the energy available increased and so did our comfort. A couple of thousand years ago, that energy increased still further when we domesticated animals. Animals could labour in our place or in some societies slavery increased the work done per "citizen". Those labourers had to be fed - our energy demand increased alongside increased prosperity. So, even before money, energy was adding to prosperity. We have all heard that some warmist say that they "are certain" manmade CO2 caused the 20th century temperature rise. They mean CO2 levels rise was "correlated" with global temperature rise (Fig1). this is not exactly convincing. Much of the global temperature change such as the 1940 bump is unexplained by changes in CO2. graph is in fact entirely bogus. no reliable CO2 data before 1958, so that portion of the graph is entirely fiction. Effect of CO2 is much smaller than suggested. Actual rise due to CO2 greenhouse warming is as shown below (blue line). The graph breaks down after 1998 as shown by my graph #3. World GDP and world energy show a much higher degree correlation. As world GDP (blue) rises and falls, total world energy use (pink) also rises and falls in sync. 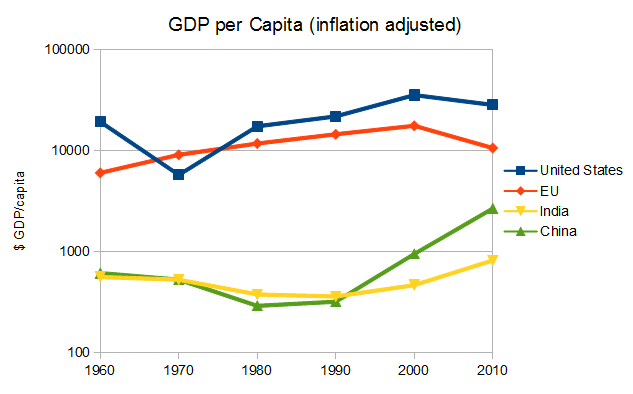 And if we look at Fig 6 we see that GDP per capita rises the more energy each country has. This shows that for all reasonable purposes Energy is a proxy for world GDP. In other words if GDP rises, energy rises, or if energy usage rises then we should expect GDP to rise. 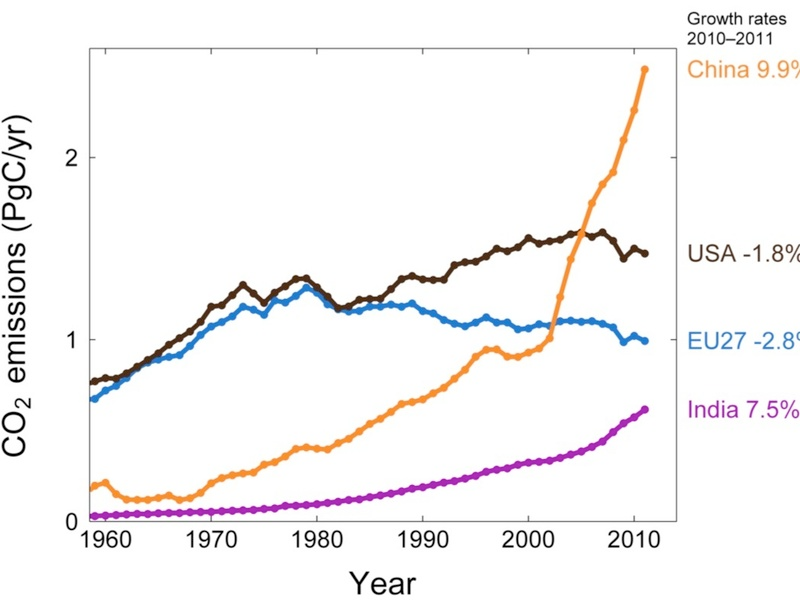 As fig 7 shows, there is a natural increase in energy use as countries increase GDP. Or is it the other way around? Does rising energy availability lead to rising GDP? graph shows energy used in producing materials is very closely linked to the cost. but rising GDP and rising energy use are the same thing! The problem with Green economics - destroy the economy to "Save the planet"
Long known that we cannot have GDP growth without growing the availability of energy. Usually, argument is: we must reduce economic activity to "save the planet". What happens when we reduce energy usage? And what has been the effect on GDP? Moderate warming as we expect from the greenhouse effect of the small increase in CO2 is overwhelmingly beneficial ... as anyone with a greenhouse will know! ... particularly in Scotland. So, the anti-capitalist argument of "destroy the world economy to save the planet" is just hogwash. The reason for this is obvious when we understand that energy and money are two sides of the same measure. However in practical terms, all saving money from e.g. insulating our homes does, is to save us money. What do we then do with this extra money? We spend it .... on goods which have taken just as much energy to produce as the energy saved. So ... just the same amount of energy is used ... just in a different place. Rising GDP means we can all afford to buy a bigger and bigger basket of the typical goods. Those goods take energy to produce. For food, that energy is largely natural. For manufactured goods, most of that energy is from fossil fuels. The energy used to produce goods - the "stored energy value" of e.g. a "Mars bar" or an apple, or even a simple steel knife, set by energy costs in manufacture. Whilst energy use may vary between manufacturers. In a free market, all other things being equal we choose the lowest cost goods. In free market we choose the goods using the lowest energy to produce. In a free market, the cost of any good largely reflects the energy used in producing that good. Therefore because free markets encourage the lowest priced goods. In a free market, the energy used in producing any good is minimised. If any energy source per KWH costs more than the average market price for energy in KWH, then the energy consumed in producing that energy is greater than that produced. Rather than a free market being wasteful ... free markets are the best way to ensure maximum energy efficiency. Distortions to the market tend to reduce energy and economic efficiency. The result is economic decline as we have seen in Europe. Stop politicians interfering with the cost of energy. Even if CO2 were a problem, because wind is so expensive, it is almost certain that more CO2 is produced as a result of this policy than without it. Stop wasting our money on wasteful wind. Greg Cochran On Scientific Progress, Education & "Social Science"
How doctors are not good at spotting anomalies and thus in spotting potential scientific breakthroughs. This means that there must be potential "low hanging fruit" if we look. I would also add that the regulatory burden on medicines is so heavy that it must be holding back or indeed preventing research in new medicines. This is to prevent horrors like thalidomide but, at about £1 billion just to get a new medicine accepted, I am certain a cost benefit analysis would show lives saved by not having thalidomide would be a fraction of those lost by not having hundreds of useful medicines. I would suggest that restrictions on testing should be entirely lifted for subjects of 60 or over and that medicines not tested up to government level should be available, clearly labelled as such, I suspect that other institutions would spring up willing to test more cheaply & quickly than government and that companies would be happy to put them on the label. Specifically any successful medicine against Alzheimers (there are a number of candidates) will not be available for at least 10 years and I am certain a lot of people, seeing early onset, would risk it. we were discussing per-pupil expenditure by state in primary and secondary education. Utah is famous for having the lowest per-pupil funding in the country. We are right next to and similar in many ways to Wyoming, which has one of the highest funding levels in the country. The dollars per student are $7,200 in Utah and $18,000 in Wyoming according to this source. Caution is always in order, of course, but these numbers are in broad agreement with other sources and other years. So spending has between little or nothing to do with success. This, incidentally, explains how Habits of Highly Successful Countries could find there was no correlation between education budgets and economic success. The standard belief in the academy is that there are no such personality differences between ethnic groups and races. It’s not that they have some kind of argument based on genetics and selection and prehistory that makes such differences super-unlikely: no, it can’t be true because it would hurt their feelings. You know, the people populating the social sciences are bound to be right about something, eventually. This is why he is politically incorrect. One fairly obvious, little-discussed variety of low-hanging technological fruit are those ideas and devices that are already known – to but a few. Secrets. Sometimes important secrets are deliberately kept for a long time. Consider the Chamberlen family. Peter Chamberlen the elder [1560-1631] was the son of a Huguenot surgeon who had left France in 1576. He invented obstetric forceps , a surgical instrument similar to a pair of tongs, useful in extracting the baby in a difficult birth. He, his brother, and his brother’s descendants preserved and prospered from their private technology for 125 years. Sometimes the future is already here, but not generally known. Sometimes it’s hidden, sometimes it’s forgotten, sometimes it’s in Latin. There have to be better ways of finding and disseminating those secrets. I have discussed this and the Chamberlens before. I put up this comment. This is a strong argument for either watertight patent laws, which I don’t think is possible, or a significant part of gdp going to technology prizes. I've read that 3rd parties get 3 times as much value from inventions as the inventors do which means prizes should be about 3 times the value obtained by patents. This is difficult to estimate but looks like at least 6% of gdp. Most people think that science and math and engineering are found everywhere, like soccer, but actually, they are regional practices, more like hurling or tossing the caber. 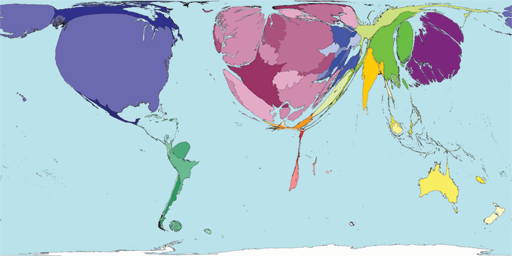 In the map, countries are resized according to the number of scientific papers they produce. Population size plays a role, but average productivity matters more. Note that Singapore, with a population of 5 million, looks bigger than Indonesia, with 240 million people. China, Russia, India, S Korea all building reactors at about 1/3rd the European cost. China's nuclear reactors tend to cost from $1500 to $2500 per KW. This is a far lower cost than in Europe or the US. Controlled cost is a good reason that China is building about 28 out of the 69 nuclear reactors under construction in the world. China, Russia, India and South Korea are where 50 out of the 69 world nuclear reactors are being built. They all have construction costs under control and tend to be 2 to 3 times cheaper than in Europe or the USA. Since the RAE figures show British nuclear is about 40% of the cost of the average of the basket we use (probably less as prices rise) combined with it being possible to drop the prices by 2/3rds means the cost of our electricity bills not only could be reduced by about 90% but that this is happening elsewhere in the world. her - mass production always means that. ld like to be able to say “yes a science degree is a good thing”. But the reality is that academic science is so politically motivated and so appalling at delivering anything useful to those doing degrees or to society in general … that whilst I would prefer a scientifically literate society, I cannot in all honesty recommend British science to anyone." Genes changing but not through direct inheritance? They took 250 of the youngest bees from each hive, and painted marks on the bees’ tiny backs. Then they switched each set of newborns into the hive of the other subspecies. When Alaux looked at the gene-expression profiles of the bees exposed again and again to alarm pheromone, he and Robinson saw why: With repeated alarms, hundreds of genes—genes that previous studies had associated with aggression—grew progressively busier. The rise in gene expression neatly matched the rise in the aggressiveness of the bees’ response to threats. I thought I had invented the word "Beeboid", and was pleased to find it gaining common usage. 14,200 uses online and the Urban Dictionary - actually 2 different usages - for an unreasoning online fan of the BBC (July 2011) or for a BBC employee uncorrupted by respect for the truth (July 2012 ). I have always used it for definition #2 and though there are still some people who automatically defend the BBC's integrity I find them increasingly rare except where they appear to be financially linked to the organisation, which would mean they fitted my definition anyway. My earliest use in my blog was Aug 2011 and I had used it in online comments prior to that but the earliest usages I can find are several around 2007 in the comments on Iain Dale's Dairy of which I was a regular reader so I must have adopted it by osmosis. But it does describe the bastards well doesn't it? Wonder when it will make the OED. Proportional Representation - Will It Be An Issue In The Next Election? 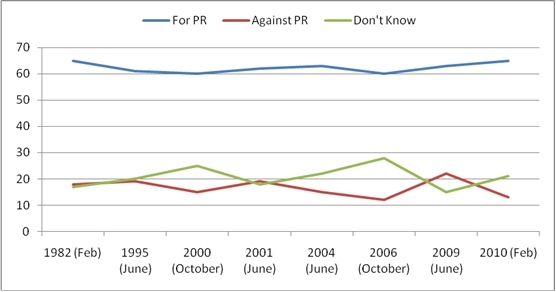 "One question not asked here, following UKIP’s success is are the LibDems still enthusiastic for PR. For all my life this has been the one policy all LibDems were known for and agreed on but when the council elections were declared Simon Hughes went to great lengths to insist that UKIP had not overtaken the LDs because the latter may have had fewer votes but because of the FPTP system they still have more councillors. Paint me cynical but the LDs principled support for PR seems little mentioned now. Does the party still actively, not just nominally, support it?" The "political consensus" is that the establishment saw off proportional representation for a generation by winning the "not actually PE but all we'll let you consider" referendum by refusing to debate the issue and being rude about Clegg. You don't get much more conclusive than that, though to be fair the producers of it made a desperate attempt to say otherwise. Also interesting is that there seems to be a total halt to polling on the subject since, which shows how much the agenda is set from on high. However an absence of looking for evidence is not evidence for a change of view and it seems overwhelmingly likely that there is still a similar disparity between supporters of democratic elections and of the present corrupt system. I suspect that this is both going to become more of an issue and an issue on which opinion is even more unanimous, as we approach the next election. It seems likely that the largest party, even if it doesn't get an absolute majority, will have little over 30% of the vote. Labour might even pull an overall majority on that. UKIP and the Conservatives could each get about 25% and the LDs 10% with drastically different (& smaller) representation. The old defence of FPTP, that it produces stability and strong government will be completely exposed, since whatever the law, any Labour government behaving dictatorially would merely make the nation ungovernable. UKIP is committed to PR (& as the comment above shows) may be the only party now fully so committed. PR is also the one policy on which all "LibDems" agree so it would be extremely difficult for the party to advise voting Labour or Tory in preference to UKIP in seats where their own candidate has no chance. It is also one of the issues for which the accusation that UKIP is "right wing" is clearly proven false. Lets see. Click on this poll. If you choose the 3rd answer please comment here. I have recently read Nigel Farage's autobiography Flying Free and it confirms my opinion that the party he leads is basically reinventing the Liberal party as historically defined, the Pseudoliberals having sold their inheritance for a mess of parasitism.